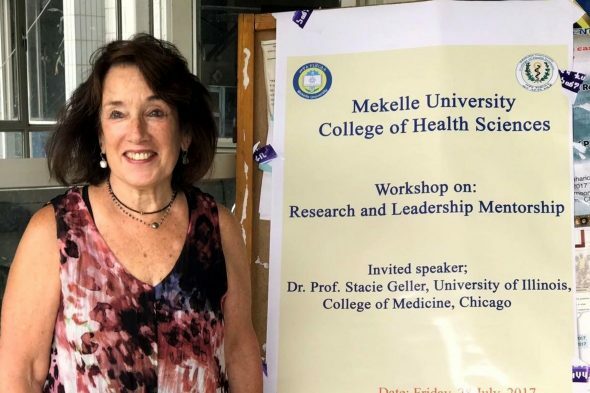 “We’re scientists and doctors; we can never stop learning from and teaching one another,” Stacie Geller told Ethiopian OB/GYN residents. The Mela Project has been working with OB/GYN residents in Ethiopia for a number of years, but in its progress toward building a center of excellence at Mekelle University, UIC has expanded its work to include mentorship training. Amidst academic and clinical subspecialty training, Stacie Geller, the G. William and Clair Mae Arends Professor of obstetrics and gynecology, reminded future practitioners and researchers that effective mentoring is a key part of advancing academic excellence. Geller shared experience-based insights with more than 50 practitioners while learning about the challenges faced locally in Ethiopia. “We know that most successful faculty have been mentored, and that mentoring has been shown to increase career satisfaction, improve career advancement and increase recruitment and retention,” Geller said during the lecture. Geller highlighted the importance of mentoring in the development of new leaders, and reminded practitioners that a mentor is different from an advisor. “Mentors are liberal with constructive feedback, communicate well, encourage independent behavior while still investing time, and help provide new opportunities,” Geller said. Ayder staff said that workload was a barrier in their ability to mentor junior faculty. “Mentoring relationships are never one-sided,” Geller said. “Consider what areas of your work might be a learning opportunity for your mentee, and invite them to be part of it.